Back in June 2014 WHYY-TV in Philadelphia, who does a weekly show on goings-on in Delaware, did a nice segment on Lead Graffiti. 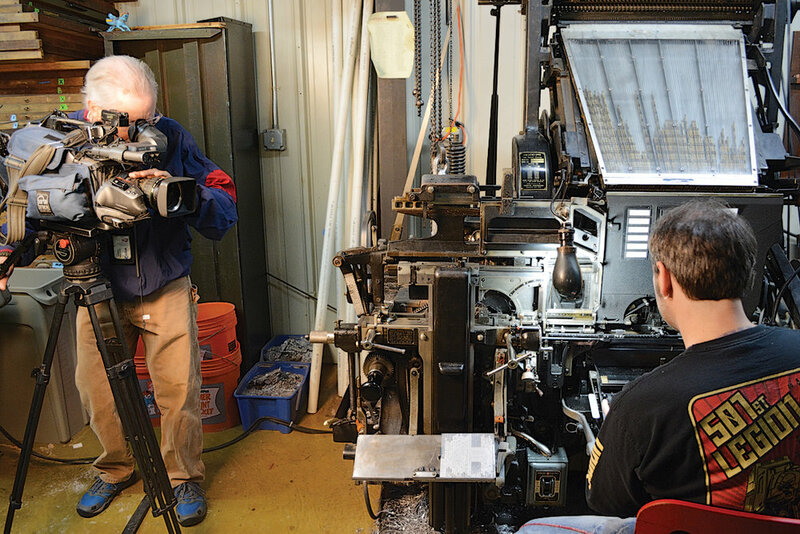 In the photo below you can see the WHYY-TV cinematographer recording Tray working on our Intertype C$ linecaster. Be sure to link to the almost 4:00 segment below. They had just listed their WHYY’s Best of 2014 entitled “First for Friday, December 19, 2014.” Quite nicely and totally unexpected, we are listed first and were the opening segment. Seriously, how nice is all of that. At the top you can see an image of Jill from the segment. They interviewed the 3 of us, filming every corner of our studio, equipment, type, and lots of our work.. I think we came off pretty well, even mentioning goosebumps twice. Take a look and let us know what you think. Link to WHYY-TV Best of Delaware 2014. Our segment starts at 00:44 and runs through 4:23.